It’s a SWEATER, Charlie Brown! 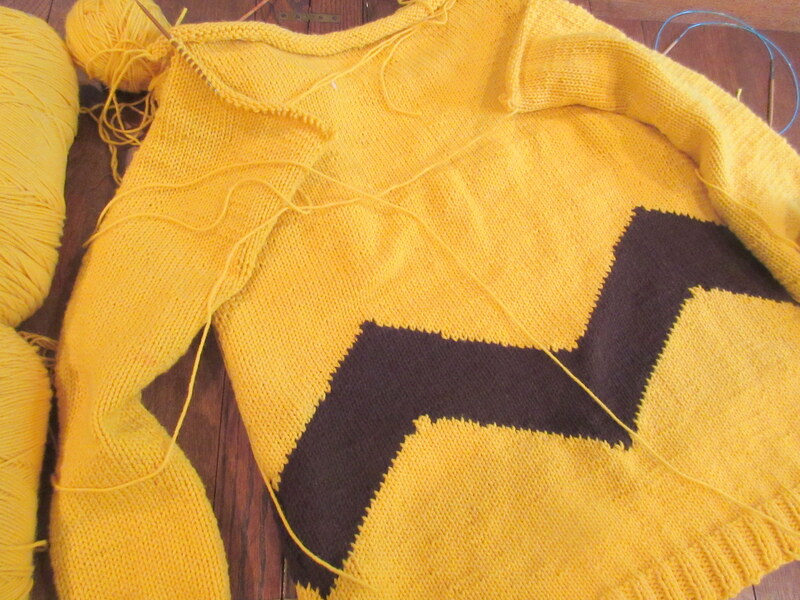 Elaine’s knitting has gained her some international attention as she premiered her one-woman show SWEATER CURSE: A YARN ABOUT LOVE to the Edinburgh (Scotland) Fringe in 2013 and has taken the show back several times since, as it is always an audience favorite. SWEATER CURSE is Elaine’s one-act solo comedy about unraveled sweaters, knitting and knotty romances. She has also performed it locally and taken it on the road to San Antonio, New Orleans, and wherever her yarn feels called. And her shows are fun offstage too because her audiences are encouraged to bring their own needlework so their hands can be kept busy throughout her performance. Talk about interactive theater! Flying without a pattern this time, Elaine borrowed one of Christopher’s sweaters as a fit reference.When you see the show, you will see that she nailed (ahem knitted), the PERFECT fit! After testing some color swatches to get just the right shades, she began her quest. It took Elaine 2-3 weeks and over 100 hours of knitting and sewing before she finally announced to her Facebook friends on November 11 that it was on its way to DCT! What’s funny to me is how many of Elaine’s friends, when they first saw the photo of the finished product quickly asked, “WHERE did you get THAT?” It struck me funny because they obviously didn’t read her post, and also because I had no idea that Charlie Brown was such an icon for fashion! Women all over DFW wanted one just like it! 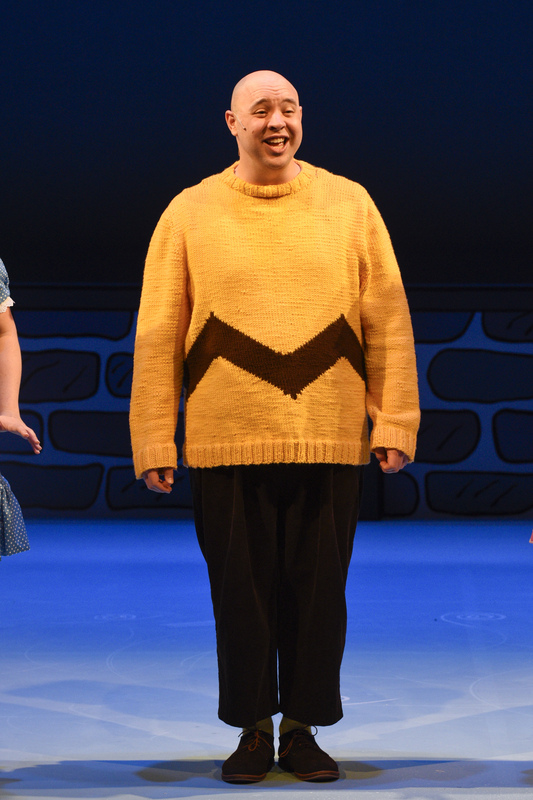 Costume designer Lyle Huchton explains, “I knew from the beginning that I wanted the iconic Charlie Brown shirt made into a sweater and after asking around I could find no one who would commit to doing it. I knew that Elaine knitted, although she and I had never met, so I reached out to her to see if she was interested or if she knew someone who might be. I was thrilled when she agreed to do it. I know I was over the top when I saw A CHARLIE BROWN CHRISTMAS. Hopefully you will be too, and you may even find yourself wanting a handmade Charlie Brown sweater from Elaine Liner! If you do, get this, Elaine has agreed to knit one more to support the cause of great productions for children via a DCT auction. Just go to dct.org/bid and put your name in the hat…or in this case, the sweater! A CHARLIE BROWN CHRISTMAS and Kathy Burks Theatre of Puppetry Arts’ THE NUTCRACKER run through December 21.